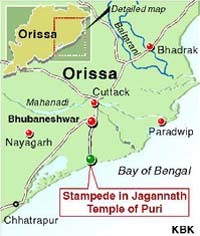 A stampede at the 12th century Sri Jagannath temple here today left four persons, including three women, dead and around 20 others injured, prompting the Orissa Government to order a judicial inquiry into the incident. The presence of a senior bureaucrat at Sri Jagannath temple in Puri and the shrine administration’s efforts to ensure a “smooth visit” for the dignitary could have triggered the stampede that claimed four lives today. 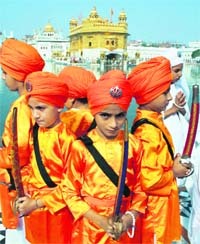 Some ‘sevayats’ (servers) at the temple claimed the gate near the ‘Sata Pahacha’ was closed after the bureaucrat arrived and this caused a commotion among the assembled people. As many as 15 babies died during the past 24 hours at Kolkata’s Dr B.C. Roy Child’s Hospital allegedly due to septicaemia and other infectious diseases, which caused panic in the city. A farmer of Jangirana village died after he was reportedly manhandled by some Punjab State Electricity Board employees while they were carrying out raids in the village today. Unravelling further links in the Navy war room leak case, the CBI has arrested a former Navy Captain for allegedly stealing highly classified documents. The CBI, after registering a case against Capt Salam Singh Rathore, arrested him from his house here late last night for alleged violation of the Officials Secrets Act. With a new engine and a weapons pack, the indigenous Dhruv advance light helicopter is set to attain new heights. Haryana will launch “tap water in each home” project at an estimated cost of Rs 700 crore aimed at generating at least 20,000 direct and indirected jobs in the state. “In 41 years since the state's formation only seven lakh households have water tap connection in their premises. Delhi University today honoured Bollywood super star Amitabh Bachchan, Delhi Chief Minister, Ms Sheila Dikshit, cartoonist R K Laxman and prominent scientist Dr. C N R Rao with honorary degrees at a special convocation here. 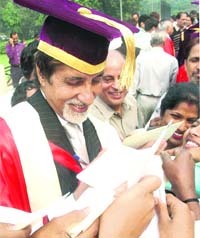 AUR AB ASLI DON: Amitabh Bachchan signs autographs for staff members of Delhi University after an honorary doctorate was conferred on him by the university in New Delhi, on Saturday.